"The second act of the epic Sonic the Hedgehog and Mega Man crossover event BEGINS HERE! “When Worlds Collide” Part Five of Twelve: Sonic, Mega Man, Tails and Proto Man enter the strange world of the Skull Egg Zone. They don’t receive a warm welcome, either, as the Genesis Unit and Copy Robot attack! Drs. Eggman and Wily wait in the wings with an even more sinister surprise waiting to be unleashed! 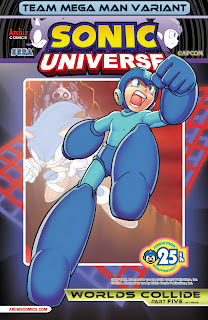 You cannot miss this action-packed issue, featuring new cover art by Patrick “SPAZ” Spaziante, and choose YOUR favorite hero with the “Team Sonic” and “Team Mega Man” variant covers!" Having the Genesis Unit be a part of a Sonic crossover is actually kind of clever. The Genesis Unit, eh? Wonder if they're made by Eggman in this continuity (though I doubt it). 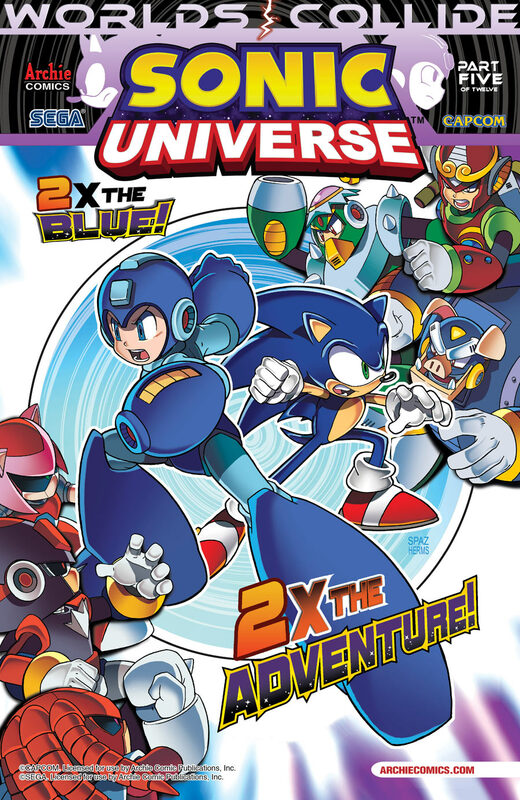 Already, I'm picturing Sonic staring down the Genesis Unit from Wily Tower and saying to himself "Oh yeah, this just keeps getting better and better." 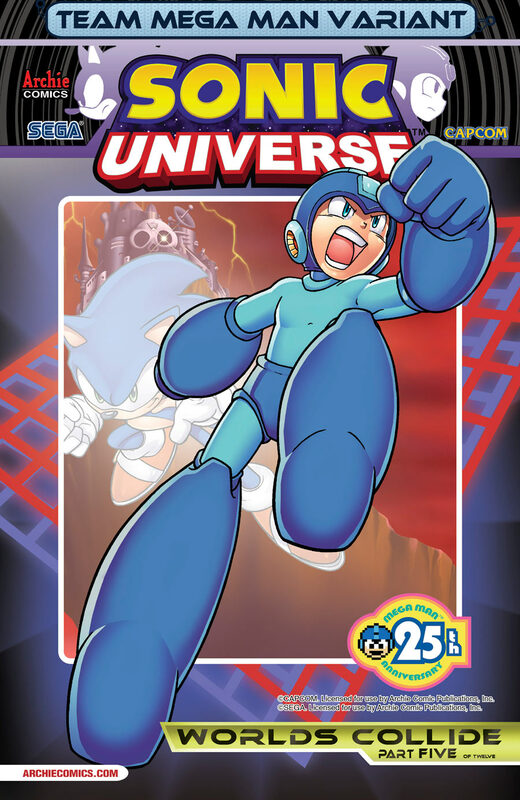 And anon1's right, its both clever and fitting that Sega's mascot be taking on the Genesis Unit. THIS IS THE GAME WE WANT! MAKE IT SO! @Cyberguy: How would it work? Both of the game's styles kills the other. Sonic is all about speed, and the gameplay acts almost like a rail game, where you have multiple paths and such to take. While utilizing what comes along in the stage for points and stat changes, and surviving on a ring. Once and a while you have platforming segments that are slow in pace, but rarely. Sonic1 had the most in common with Mega Man. While Mega Man acts more like a traditional platformer, where you get to pick your stage and gun your way through it (instead of hoping on heads) without having your health bar depleted along the way. It uses controlled precision gameplay most of the time through the stages. The only way I see this working is if they have specific stages designed for them, but there would be no need to mix the games if that were the case, really. 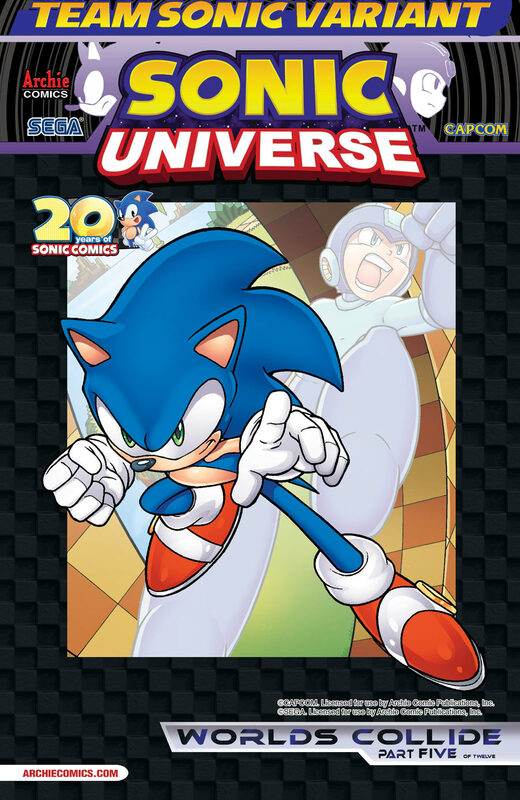 @12:27 PM Anon: Have Megaman ride on Sonic's shoulders. ...OK, so that might not fix everything, but I'm sure SEGA could find a way to comfortably merge the two styles (I say SEGA because Capcom probably couldn't be arsed). @12:27 PM Anon: Geeze, what a killjoy. @Cyberguy: Sonic generations didn't have two completely opposing styles, it just had two styles that complemented each other in different perspectives. Stages were slightly altered to accommodate one Sonic's gameplay over the other, but nowhere near the point it would need to make Mega Man and Sonic work. Wow! 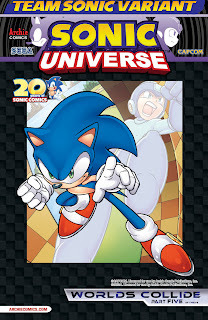 I have to give Archie credit, it is pretty cool that they have the Genesis unit come in during this crossover! Clever, clever. That said, I still wouldn't want a crossover game. :P Sorry for being a killjoy myself. I want a good MM release to come out before I even entertain the notion of a crossover like this.